You spoke up when kids were being ripped from the arms of their parents earlier this year by signing our petition and joining one of the hundreds of protests around the country. Your actions forced President Trump to reverse course and publicly vow to stop the practice and reunite all families (which, by the way, has still not happened). Now, you need to speak up again, because the administration has concocted a new way to attack kids and their families. Trump’s officials now want to indefinitely detain and traumatize families by overturning a long-standing court decision known as the Flores Settlement Agreement. Flores, a result of over a decade of litigation, defined minimum protections for migrant children, including access to basic human rights like appropriate food, shelter, health care, education, and legal support. It also limited the time a minor could spend in detention with their families to 20 days. Yet this administration can’t even comply with this bare minimum and is now set on destroying necessary safeguards to protect migrant children. The proposed changes would indefinitely detain children, lower standards of care in immigration jails, and get rid of legal protections for minors seeking safety in the United States. These changes are completely unacceptable. Make sure our government hears your outrage! Before these proposed regulations take effect, we have the chance to voice our opinion by submitting official comments. And that’s where you come in. Tell the administration before November 6th that the role of the government is to protect children, not perpetuate trauma! Speak up to oppose the indefinite detention and mistreatment of migrant children! There’s a lot of complicated legal jargon flying around, but we can’t let it distract us from what matters—the treatment of kids. That’s why we’ve partnered with over a dozen organizations to make it even easier for you to submit your official comment. 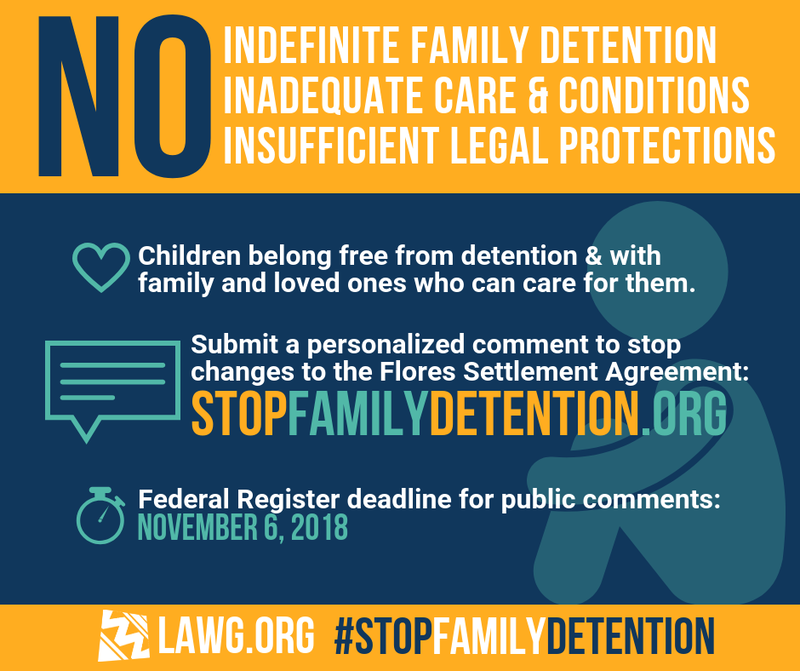 Go to StopFamilyDetention.org to check out pointers and an outline of what to write—just make sure to add your unique voice so that your comment has the greatest impact! And, make sure to submit your comment before November 6th deadline. Every perspective and personal comment counts. Submit yours now! Already submitted your personal comment? Help us get others on board. Join a digital day of action TODAY by sharing this action on Twitter and Facebook.